Complimentary Accidental Disability Covers for SMIJS Members by ACE. 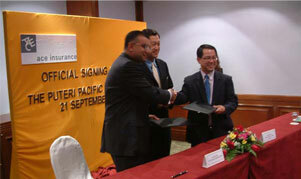 SMI Johor Selatan signed a memorandum of understanding (MoU) with Ace Synergy Insurance Berhad on September 21, 2007 witnessed by YB Tan Kok Hong, Johor State Committee Chairman for International Trade and Industry, Energy, Water and Telecommunications. 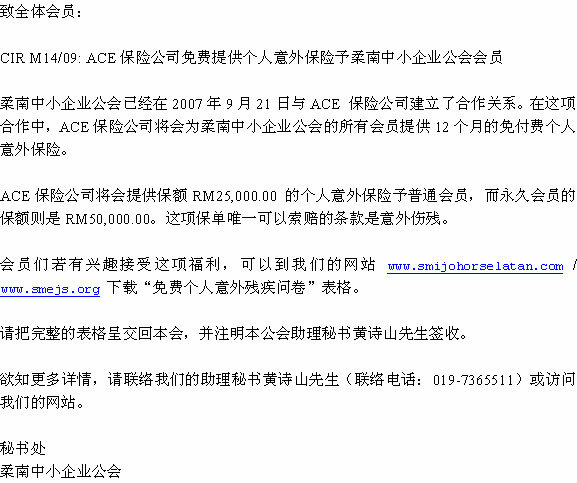 SMI Johor Selatan had entered into the Partnership with ACE on Sept 21, 2007 where ACE will provide Complimentary Personal Accident Covers for all the SMI Johor Selatan members at no cost for 12 months. ACE offer Complimentary Accidental Disability Covers with coverage of RM25,000.00 for Ordinary members and RM50,000.00 for Life members. The benefit covers for Accidental Disability only. Please submit the completed form to the association to the attention of our Asst Secretary Mr Ng See Sun. For further information, please contact our Asst Secretary Mr.Ng See Sun at 019-7365511 or visit our website.